Easily the best set of aquatic macroinvertebrate ID cards available to educators. 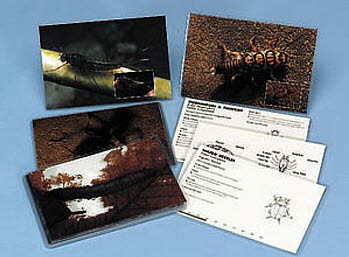 Each card features a full-color photograph of a commonly found aquatic macroinvertebrate on the front of the card and detailed line drawing with critical identification tips on the back. Ideal for environmental laboratory and field work at any level. Set of 18 laminated flash cards.